Post-Frontier intends to investigate the condition of the southern borders of Europe. Accentuated by its relationship to the Mediterranean Sea, the project will analyze the political, reg- ulatory and territorial ambiguities that persist throughout its territories. Contemporary surveillance systems perceptibly affect the tenuous relationship between confined territory and excluded territory, emphasizing the differences in those places where the distances between the one and the other increase or diminish. The massive undertaking to organize these devices generates a dysto- pian framework in which each region, maintaining its political and morphological identity, is cloned and delocalized, delineating the border pattern of the rising European nation state. 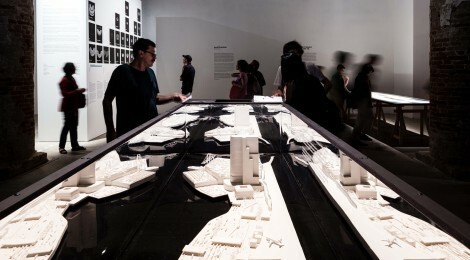 The installation was unveiled and is currently exhibited in the section Monditalia at the 14th International Architecture Exhibition of la Biennale di Venezia from June 7 until November 23.
credits/crediti autori/authors Giacomo Cantoni, Pietro Pagliaro team Petra Di Bert, Jacopo Lamura, Francesca Pagliaro, Ignacio Servetto, Caterina Spadoni, Cecilia Tramontano, with Martina Barcelloni Corte, Midori Hasuike, Niku Alex Muçaj, Elian Stefa, photo editing Giulia Tornari – (www.zona.org) photos Francesco Anselmi, Lorenzo Meloni, Alessandro Penso; Giulio Piscitelli, Gianfranco Tripodo sound Alessio Genovese, Alessandro Librio – Zabbara (www.zabbara.org) interview courtesy of Ewa Moncure, Press Officer, FRONTEX.